Riyadh, Asharq Al-Awsat—Legitimate Yemeni President Abd Rabbuh Mansur Hadi opened a conference on Yemen in the Saudi capital Riyadh on Sunday, urging for a return to the Gulf-backed initiative on the country’s post-Arab Spring future. Hadi told those gathered at the three-day conference it was necessary to return to the outcomes of the initiative, which were finalized in January 2014, in order to rebuild the country after months of instability. The current turmoil in Yemen began in September of 2014, eight months after the agreement on the Gulf initiative, after the takeover of the capital Sana’a by the Iran-backed Shi’ite Houthi movement. The Houthis chose to boycott Sunday’s conference, which drew over 400 figures from Yemen’s different political factions, and Hadi said the initiative was taking place “in support of politics and community” and in “rejection” of the Houthi coup, which the movement forced in February. Hadi urged the international community and the UN to help put an end to the fighting in Yemen which has seen the Houthis’ militias clash with volunteer forces on the ground loyal to Hadi and the advent of airstrikes by a Saudi-led coalition of Arab partners. The airstrikes began in March when Hadi fled the country after being held under house arrest by the Houthis. He then headed to Riyadh to urge Arab countries to intervene to restore political legitimacy to Yemen. 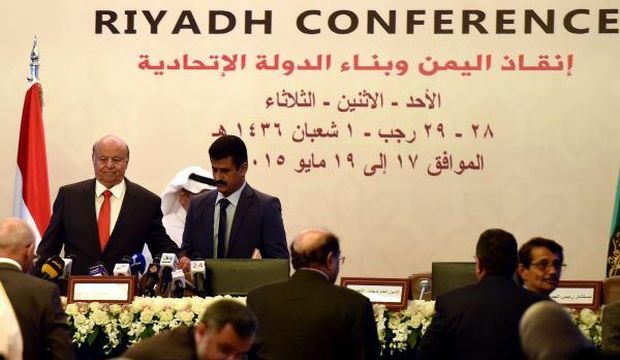 Also present at the conference were members of the General People’s Congress (GPC) party led by ousted former president Ali Abdullah Saleh, who agreed to leave power after 33 years as the country’s president following the 2014 Gulf initiative. Saleh has been accused along with Iran of backing the Houthi coup. The conference comes as a five-day humanitarian ceasefire proposed by the Saudi-led coalition is due to end on Sunday evening. The truce is subject to renewal on the condition the Houthis cease aggressive action on the ground in Yemen. The UN’s envoy for Yemen, Ismail Ould Cheikh Ahmed, told reporters on the sidelines of the conference on Sunday he was “hopeful” of an extension. “All my first contacts indicate that we have a chance, but I am really calling on all parties to extend this for a minimum of five days,” Ould Cheikh Ahmed said, according to Reuters. A senior Yemeni political figure told Asharq Al-Awsat on Saturday that “communications at various levels” remained ongoing to reach an agreement on extending the ceasefire. Despite the truce, there have been continued reports of fighting in numerous cities across the country, including in Aden and Taiz, Yemen’s third-largest city. Sources say 12 people were killed and 51 injured in Taiz on Saturday after the Houthis launched an attack on a civilian area in the city using heavy weaponry. Reports say the Houthis continue to receive support from Tehran, including weapons smuggled into the country, despite a land, sea and air blockade enforced by the Saudi-led coalition. Yemen’s Foreign Minister Yassin Riyadh told Asharq Al-Awsat via telephone on Saturday that an Iranian ship, Iran Mashhad, had earlier attempted to dock at Yemen’s Al-Hudaydah port off the Red Sea, bypassing inspection. The ship finally agreed to change course to Djibouti, where the coalition has ordered all ships attempting to enter Yemen’s waters to dock for inspection by UN monitors. Yassin said the case was “suspicious” considering Tehran claimed the ship was carrying humanitarian supplies and was about to dock at Al-Hudaydah port when it changed course. Saudi Arabia’s King Salman Bin Abdulaziz on Wednesday doubled his country’s aid pledge to Yemen to around 500 million US dollars, also opening a humanitarian center to coordinate the delivery of aid to the country, the Arabian Peninsula’s poorest, on Thursday. Speaking to Asharq Al-Awsat via telephone from Djibouti, where many Yemenis caught up in the conflict have been transferred for care and treatment by the Saudi-led coalition, Dr. Saad Qirni, the head of the Riyadh-based Physicians Across Continents NGO, said over 700 tons of medical supplies had now been transferred to the African country. He added that a large number of supplies had also been transferred into Yemen after coordination with health officials. More than 1,300 Yemenis have now been transferred by the NGO to the port of Obock in Djibouti off the Gulf of Aden in order to receive treatment, he said. Fatah Al-Rahman Youssef contributed additional reporting from Riyadh.